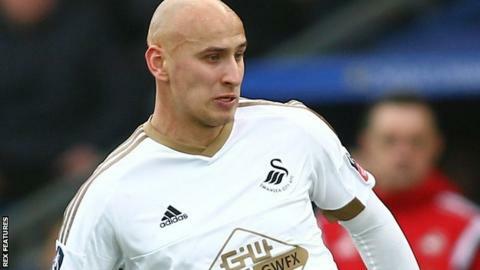 Swansea City interim manager Alan Curtis has revealed the club will consider selling England midfielder Jonjo Shelvey if they get a firm offer. League rivals Newcastle are reportedly ready to bid for 23-year-old Shelvey. "I don't think there have been any firm offers yet. If a firm offer comes in then it's probably something the club would have to consider," Curtis said. But he also underlined the need to recruit in the January window - particularly if Shelvey is sold. Former Liverpool player Shelvey was in the Swans line-up that slumped to a 3-2 FA Cup loss to League Two side Oxford United on Sunday and Curtis said the players were as ''disappointed and embarrassed'' as he was. Curtis said he would speak to Shelvey on Tuesday about the player's apparent altercation with travelling Swans fans at Oxford. Swansea now turn their attentions to Premier League survival starting with Wednesday's key battle against fellow relegation strugglers Sunderland, at the Liberty Stadum, and Curtis believes Shelvey could still be an asset in the fight to beat the drop. "I still think he has a part to play with us and if his mind is right then he can play a huge part for us between now and the end of the season," Curtis added. "If his mind is right and he wants to stay gladly we would welcome his decision to stay with us until the end of the season. "I think a fit and firing Jonjo could be a huge asset to us. "If needs be, we have to bring someone else in on the back of selling somebody like Jonjo, that is maybe an avenue the club might have to go down." Meanwhile Curtis said there had been no enquiries for striker Bafetimbi Gomis, but said the the French international might consider his future with the club if the Swans drafted in a new striker this month. "The important thing is hopefully we will bring somebody in, but if we don't bring anybody in, then it's vitally important we keep the playing staff that exist at the moment," said Curtis. "If people come in and strikers come in, then Bafetimbi might look at his future. "Bafetimbi hopefully has a big part to play with us but if somebody comes in with a concrete offer which the club feel they would like to accept, then players move on that's the nature of the game these days. "There is lots of work being done and I feel sure somebody will come in, may be one or two before the end of the window."